Located by the Glencullen river, Enniskerry, County Wicklow is one of the most charming villages in Ireland and essentially owes both its existence and appearance to the Wingfield family, Viscounts Powerscourt who for over 350 years lived on the neighbouring Powerscourt estate. Its relative proximity to Dublin has always given Enniskerry a particular appeal to residents of the city, yet despite recent developments the place has managed to maintain its distinctive character and charm. One of the reasons this may be the case is an abundance of ardent local historians; they have charted the village’s narrative, and thereby ensured memory cannot be obliterated by change. And none more enthusiastic than Michael Seery who in 2011 published Enniskerry: A History. 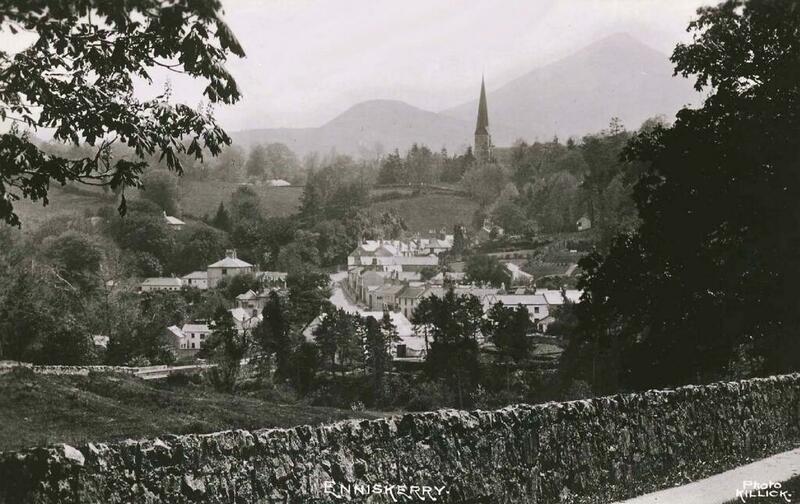 Now he has produced a second volume, Enniskerry: Archives, Notes and Stories from the Village which, in addition to featuring all the above contains many photographs and images of village and surrounding area over the centuries. It is a model of local history diligence and brio and commitment, and deserves to be widely read – and emulated. This entry was posted in Architectural History, Book, Wicklow and tagged Architectural History, County Wicklow, Enniskerry, Irish History. I am a new follower and am really enjoying your posts. Is that the same as Enniskillen? I am going there for a wedding in July. We will also be spending some time in Warrenpoint, are there any grand houses or points of nearby interest that you would recommend? Thank you for your interest. I’m afraid that Enniskerry and Enniskillen are nowhere near each other. However, there are two wonderful houses in the vicinity of Enniskillen, Florence Court and Castle Coole, both run by the National Trust and open to the public so I urge you to visit both. Also the grounds of Crom Castle are open to the public (not the house itself I’m afraid). As for Warrenpoint, not far away is Tollymore Park, former home of the Earls of Roden. Sadly the house has gone but the grounds have some outstanding examples of 18th century garden design including several early Gothick follies, so again worth seeing. By the way, I removed personal contact details from your message, I trust that was alright. Thank you again for getting in touch. Ah, the tea, the tea – sure you can’t beat it!